Safety seams: The stitching in motorcycle garments contributes greatly to the abrasion resistance of the total gear. This is why REV'IT! uses safety seams on garment areas at increased risk of impact. Safety seams have a visible as well as an invisible seam. This construction keeps the material of the outer shell together, even when the visible seam is thorn. SEEFLEX Level 2 CE protection: Certified CE-Level 2 according to the new norm EN1621-1:2012 the SEEFLEX protector is the latest innovation from the in-house R&D department. The new norm also tests the impact levels in various temperature ranges. The SEEFLEX protectors easily surpass the new norm without sacrificing wearer comfort. Prepared for Divided Chest Protector SEESOFT CE-level 1: The protector pocket in this REV'IT! garment is tailor-made to accommodate the Divided Chest Protector SEESOFT CE-level 1 - an easy upgrade to maximize safety. Prepared for SEESOFT CE-level 2 back protector insert - Type RV: The back protector pocket in this REV'IT! garment is tailor-made to accommodate the SEESOFT CE-level 2 back protector insert Type RV - an easy upgrade to maximize safety. Lorica: Lorica is constructed from microfibres that give the material characteristics similar to those of natural leather, including a leather look. This low-maintenance material is not as strong as leather, but softer and lighter, with a consistent thickness that makes it easier to process. Monaco Performance cowhide: This top-grain leather not only has had its surfaces sanded to correct imperfections, it has been reinforced to up its performance factor for riding on the track or street. Long-lasting and extremely protective. Short and long connection zipper: Thanks to the short and long connection zipper, this jacket is/these trousers are compatible for pairing with any pair of trousers/any jacket in the REV'IT! line. Jeans loop: The loop at the back of this jacket enables you to attach it to your jeans, which prevents the jacket from creeping up: no more exposed back when riding your bike. Stretch panels: The stretch panels in this garment aid in flexibility. They contribute to the riders comfort as they provide great freedom of movement. Since 1995, REV'IT has been redefining the market for motorcycle apparel. 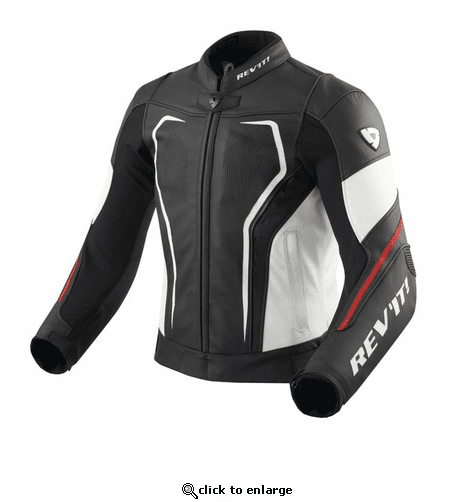 REV'IT spends countless hours of research and development with the mission to create the most innovative, functional and stylish motorcycle apparel on the market. REV'IT is a premium European brand of motorcycle apparel based out of Holland. REV'IT Motorcycle Jackets are some of the most innovative pieces of motorcycle gear on the market and we are pleased to offer you a complete selection of styles to fit your riding needs.